Since the dawn of mankind the sun and the moon have been dominant but little-understood phenomena. Today we know that the Earth revolves around the sun and the moon around the Earth. Clear lights were dominated by a bright, starry sky, because there was no light pollution and the Milky Way was clearly visible as a bright band of stars. Only in modern times did it become clear that the Milky Way is nothing more than part of the enormous solar system to which our sun also belongs. People started to interpret groups of stars that were close to each other in the firmament (but that in reality rarely had anything to do with each other) as constellations. Amidst the stable picture of constellations there were some individual stars. Only much later did it become evident that these ‘wandering stars’ are the planets which, like the Earth, revolve around the sun. Planets themselves do not emit light but reflect the light from the sun. The brightest were the Morning and Evening Star, of which it was discovered only much later that they are one and the same planet: Venus. The weaker ‘star’ Mercury was mentioned by the Babylonians as early as 3000 BC. Mars (the red planet), Jupiter and Saturn were also recognized in Ancient times. All these planets are visible with the naked eye. 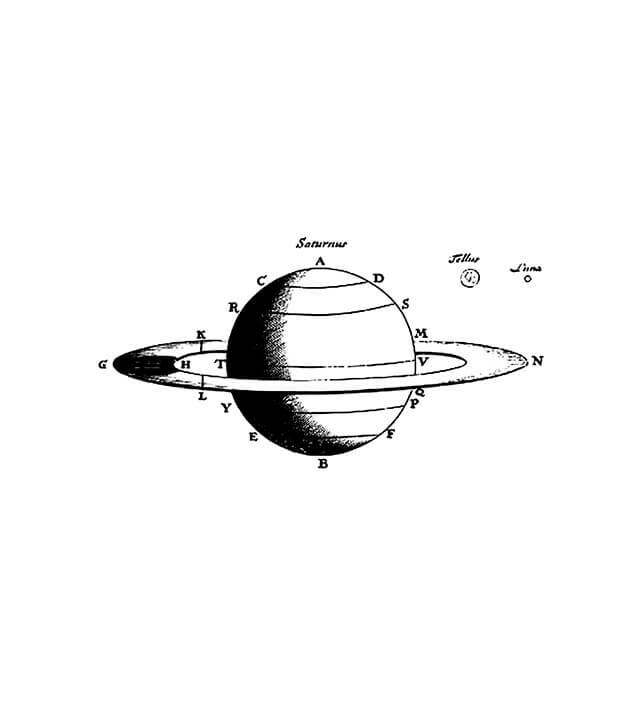 Weaker planets were observed thanks to the development of the telescope: Uranus in 1781, Neptune in 1846 and Pluto in 1930. However, in 2006 Pluto was downgraded to a dwarf planet, of which more were found, even further away than Pluto. Thanks to the old Greeks like Plato, Aristotle and Ptolemaeus we knew how all of these celestial bodies moved in relation to each other: the Earth - they thought - was the centre of the universe and the other celestial bodies revolved around the Earth, the geocentric model. 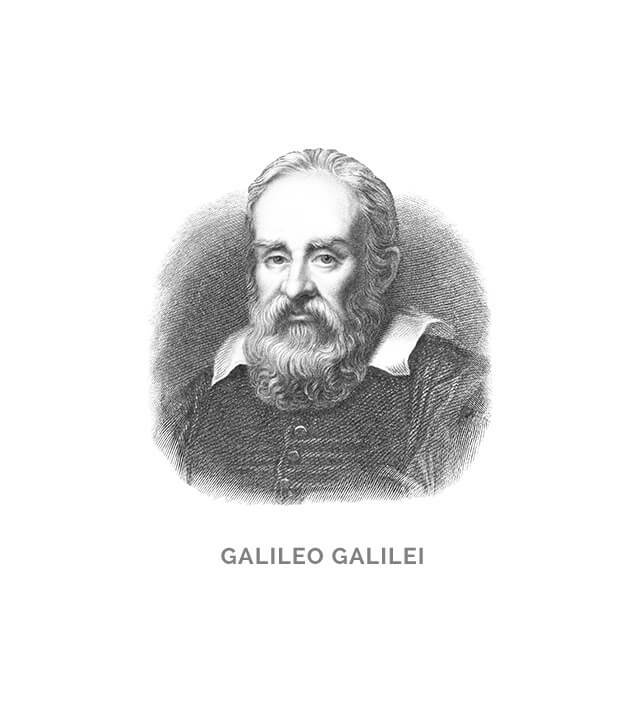 The ruling classes elevated this standpoint to a dogma, which made it hazardous to suggest a different model, as Galileo discovered to his detriment. 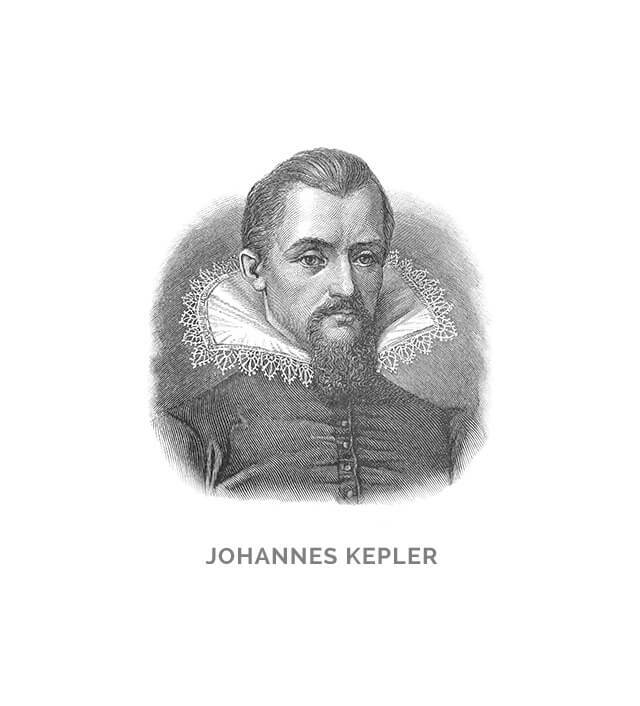 However, the truth could not remain suppressed forever and the heliocentric model - which is mostly associated with the names of Copernicus (1473-1543) and Johannes Kepler (1571-1630) - eventually became universally accepted: the planets, and therefore the Earth as well, revolve around the sun. The trajectory of the Earth (and of the other planets) is not perfectly circular, but the deviation is minor. The movements of the celestial bodies are described by elementary laws of physics and can be duplicated with the aid of cog wheels. The trajectories of all the planets are roughly in the same sphere because the planets were all formed from a flat ‘disc’ of matter that revolves around the sun. 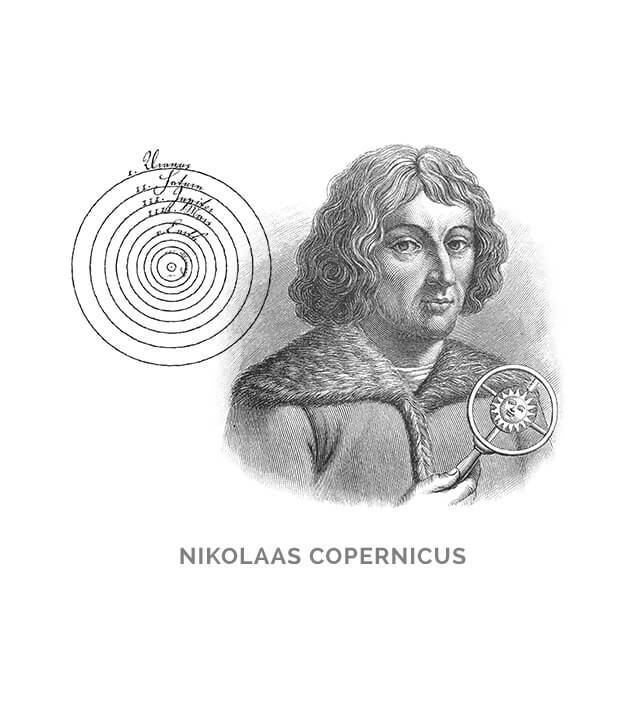 This disc is also referred to as the ecliptic plane or ‘the ecliptic’. The Earth’s rotational axis is inclined at an angle of 23.5° to this plane as is, therefore, the plane through the Earth’s equator. The Earth’s relation to the ecliptic is like that of a spinning top that isn’t standing straight and - like this spinning top - gravity is making it wobble; the Earth’s rotational axis slowly traces out a cone shape under the influence of the sun’s gravitational pull. This phenomenon is called ‘precession’. 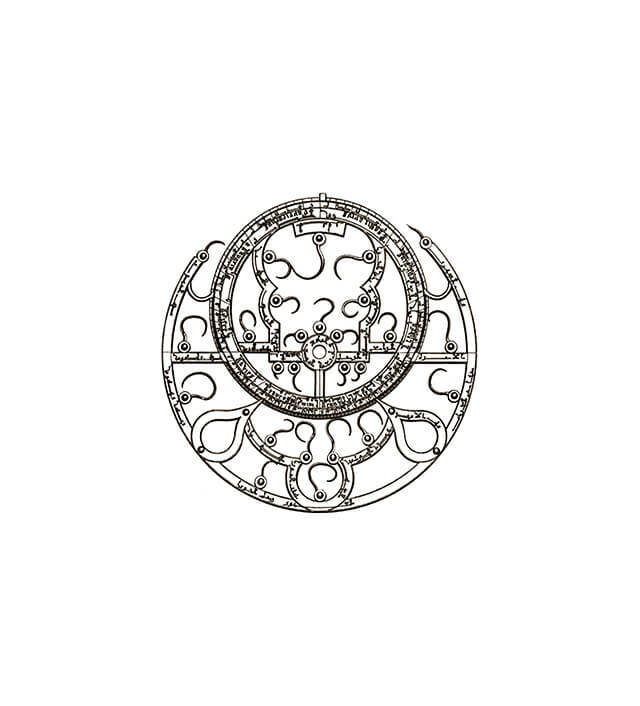 This precession affects two ways of measuring the time. In the solar time that is generally used the duration of a day and night (by definition 24 hours) is determined by the time between the 2 subsequent points when the sun is at its zenith. In sidereal time (‘star time’) 24 hours are measured by the time that lapses between two consecutive passages of the same star along a fixed meridian. Because of the precession, a sidereal day is not exactly identical to a solar day and is 23.9344699 hours, or 23 hours 56 minutes and 4.0916 seconds. The dates on which winter turns to summer and summer turns to winter are called the ‘equinoxes’. These twice-yearly events are also the time when the Earth’s axis does not point to the sun or away from the sun. At these times the days and nights are equal in length. The precession of the Earth’s rotational axis also shifts the equinoxes over a period of around 20,000 years. 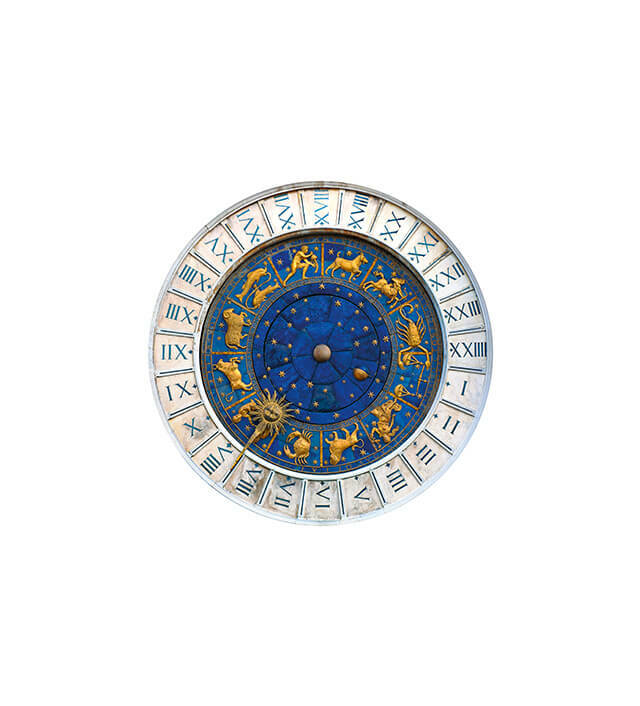 Along the ecliptic you can picture the Zodiac, consisting of the 12 star signs that are known more because of astrology than for their astronomical significance. The history of movements starts with movements for church clocks, and even for those, astronomical complications were first incorporated a long time ago. 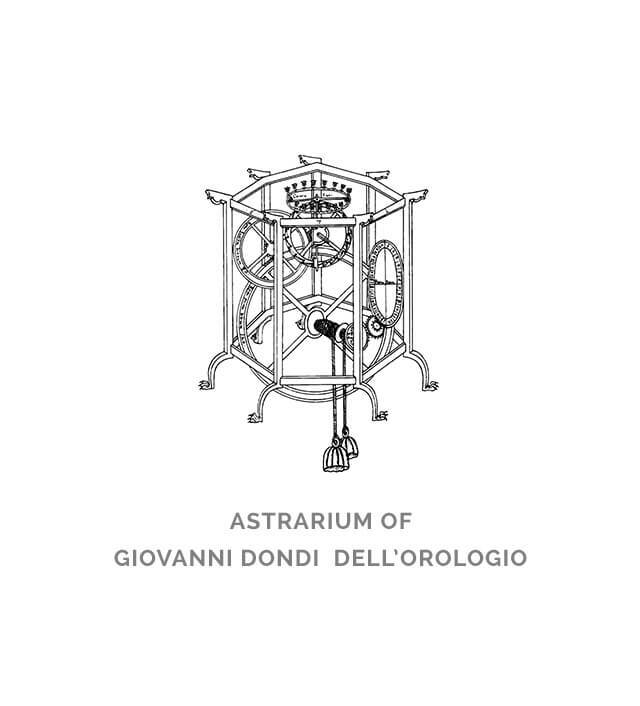 The best described planetarium clock (also referred to as ‘astrarium’) from this period, which had no fewer than 107 cog wheels, was built in Italy by Giovanni Dondi dell’Orologio also know as Giovanni de’Dondi (1330-1388). Far back in history churches already had clocks, because it was considered very important that the various church services were held at the right times. 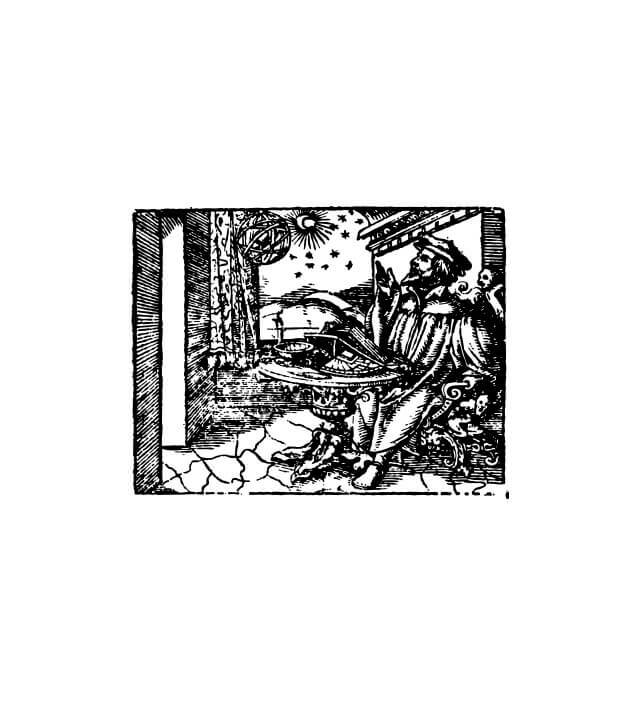 Whereas the first clocks only had a single hand for the hours, a minutes hand was soon to follow. 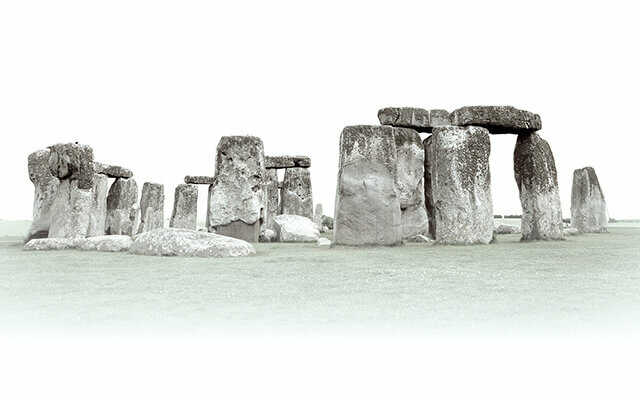 The movements were subsequently expanded with a range of complications, including astronomical ones. 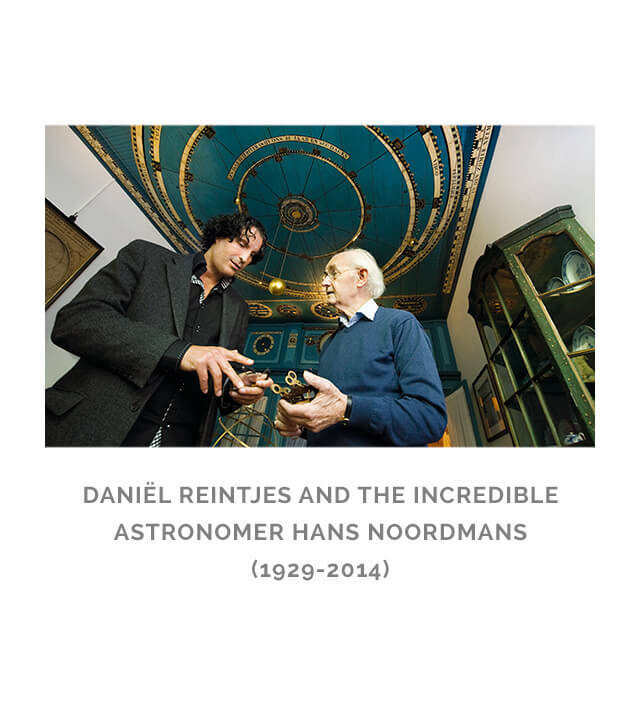 Of course, there is the wonder from the Netherlands, the planetarium of Eise Eisinga in the little town Franeker, the oldest functioning planetarium in the world. 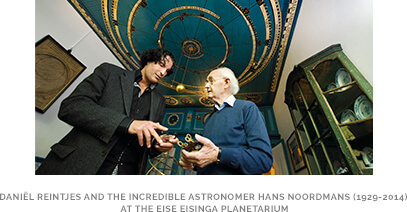 Eisinga, a wool carder, built the planetarium in 1774-1781 using 10,000 hand-forged nails as cogs. Today, Mercury, Venus, the Earth, Jupiter and Saturn still revolve around the sun at the correct times. The planetarium is powered by a pendulum clock and 9 weights. An astronomical clock is a clock which, in addition to the time of day, gives astronomical information. This may be the position of the sun or moon, the moon phase, the sidereal time or even a revolving star chart. An interesting detail is the fact that astronomical clocks normally use the geocentric model, often with the Earth in the centre of the dial. 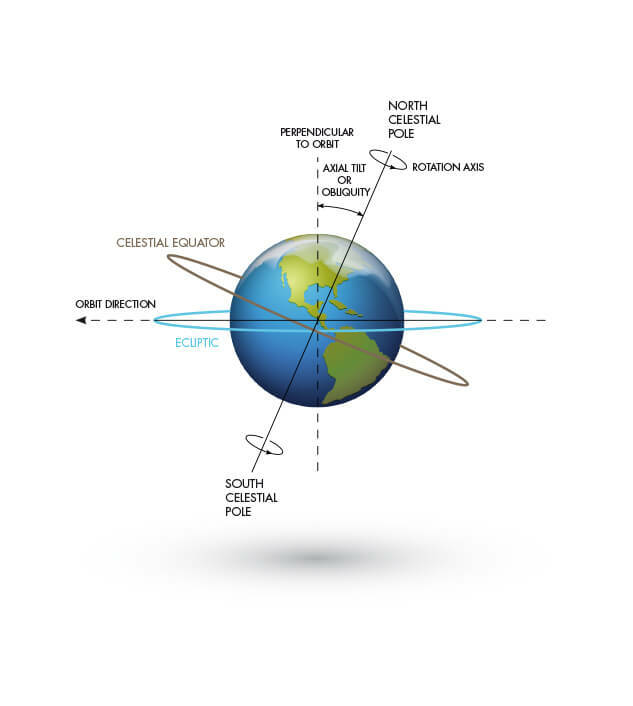 The ecliptic dial is the projection of the ecliptic plane, shown off-centre on the dial and appears to be distorted, as a result of the angled position of the Earth’s rotational axis compared to the ecliptic plane. The ecliptic dial makes one revolution every 23 hours, 56 minutes and 4.0916 seconds (in other words, one sidereal day). The complications used in astronomical clocks form the basis for smaller astronomical movements, initially in clocks, then in pocket watches and finally in wrist watches. It was a logical progression that movement makers would try to reduce astronomical complications to such an extent that they would fit inside a watch case. A tourbillon may be complicated, but many astronomical complications could only be made by the very best watchmakers and brands. Because of their size, pocket watches were most suitable; the more sizable the better. But in the end, the world’s best watchmakers succeeded in compressing astronomical complications into movements small enough to be used in wrist watches. Christiaan van der Klaauw is one of these pioneers. With an astronomical watch, a watch brand proves that its watchmakers have mastered the most difficult complications. For the aficionado the most important thing is how incredibly clever these complications are and, equally important, how beautiful they often are. 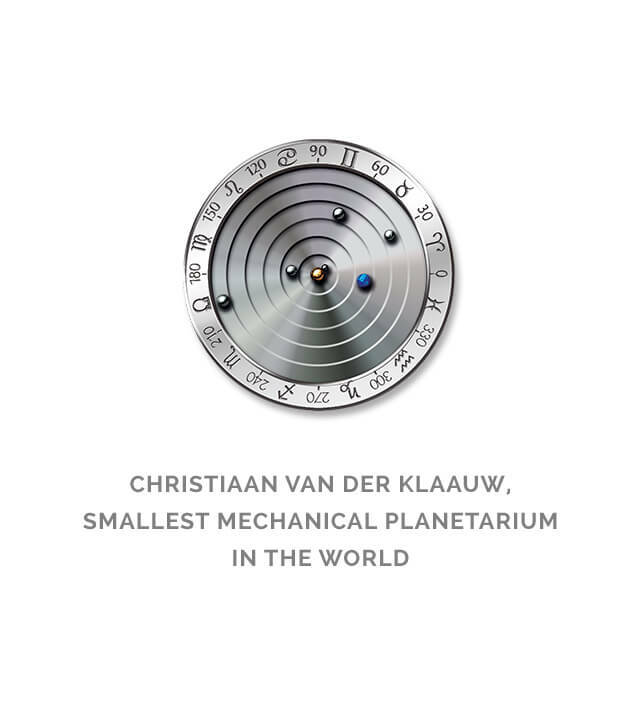 At Christiaan van der Klaauw, inspired design and classic watchmaking are combined to create works of eternal beauty. Under reservation of changes, colour deviations and any printing errors. Models and technical specifications may be subject to change. 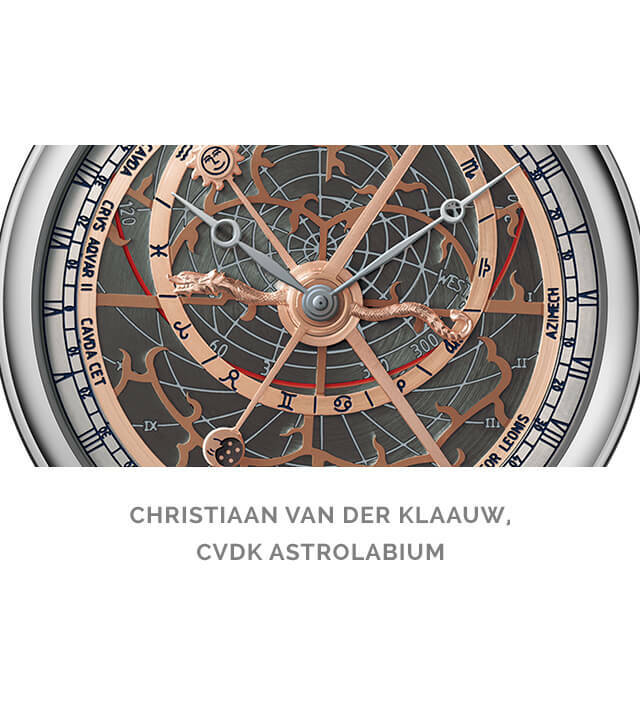 Christiaan van der Klaauw Astronomical Watches © 2015. Concept and design: Maria Reintjes van Laar. Production: Maria Reintjes van Laar, Dark Rush, Fox on the Run, Scriptonauts.